This entry was posted on March 16, 2014 at 9:24 am and is filed under 1980s, Heavy Metal, Heavy Metal and the 1980s, Music, Rock, Uncategorized with tags Americans, Blackfoot, Classic Rock, hard rock, Heavy Metal, Heavy Rock, Marauder, Southern Rock, Strikes, The 1980s, Tomcattin'. You can follow any responses to this entry through the RSS 2.0 feed. You can leave a response, or trackback from your own site. Good review – I’m a real sucker for ‘Dry County’ myself. 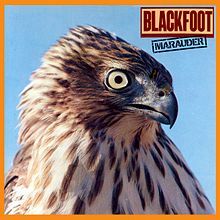 This is the only Blackfoot I own, just never got around to exploring any further. Thanks, “Dry County” is a great song and I would strongly recommend “Strikes” if you were to check out any Blackfoot material. Nice one. I love this record! You know me so well, thanks. I also love their ‘Vertical Smiles’ album lambasted by critics when it came out!